Even though Columbus was dubbed the man who discovered the "New World", the Americas were not the humble people that history has labelled them. In fact, they were far from it and had a highly advanced civilization and societal structure. From sophisticated farming techniques to large cities, the Americas were more than just your uncivilized native that needed "God" and Western moralities. This is where America Before Columbus comes into play as the documentary goes into the history of these people and how the touch of Columbus forever changed their destiny. The DVD is carefully narrated that ensures it is accessible to a wide variety of viewers and for Australian viewers, it's the perfect step into the rich history of the Americas. Add in some amazing cinematography and high quality video and this short documentary will leave you wanting to know more about not only those who were touched by Columbus but also their advanced society that prospered for several hundreds of years before the arrival of the white devils. 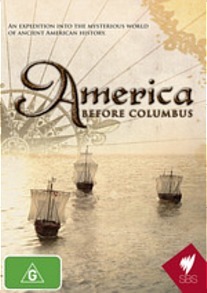 The only issue with America Before Columbus is that if you're already familiar with history, this documentary does not provide any additional new information but is rather a brief yet informative guide and history lesson during this era. Nonetheless, another first class documentary from SBS!